From the opening notes of Dudu Pukwana’s romping Mra Khali, it was clear that the Frankfurt Radio Big Band breathing new life into South African jazz anthems was going to bring a lot of joy into the room. 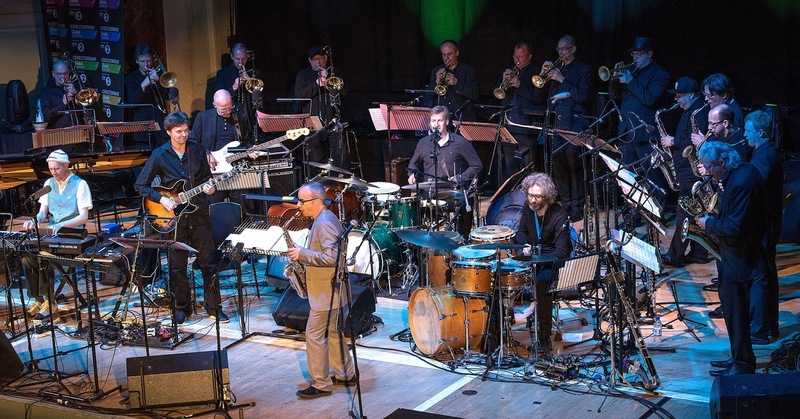 The combination of a big band with two drummers and Cheltenham Town Hall – an elegant space but with the acoustic quality of a barn – muddied the sound a little, but the feeling came through. Arranger Julian Argüelles currently has the Midas touch: his septet set was a highlight at Cheltenham in 2015, and the Frankfurt crew worked superbly with Phronesis under his direction in London in the Autumn. This project, captured on a 2015 CD that made most best-of-year lists, re-awakens the tunes by the generation of South African musicians who made such a deep impression on British players from the 1960s on – allowing Julian, brother Steve on drums and percussion and Django Bates to revisit music they love. The eagerly awaited live premiere could hardly have gone better. We heard the entire CD programme, with a bonus tune, Chris McGregor’s Sea Breeze, not on the recording. The Frankfurt soloists did the music proud, the peak effort coming from Axel Schlosser with a trumpet solo that would have pleased Hugh Masekela. Django Bates’ acoustic piano was mostly inaudible at first, but his storming synth solos made up for it. Steve Argüelles, along with regular drummer Jean Paul Höchstädter, furnished the whiplash beat that lifts township melodies. Live, these always infectious but bitter-sweet tunes and the full big band sound make a glorious combination. It didn’t quite reach the heights of Loose Tubes’ reincarnation at Cheltenham two years ago, or the Dedication Orchestra’s outing at the London Jazz Festival the same year, but a landmark gig nonetheless. A couple of hours later, Christian Scott aTunde Adjuah presented a debut gig for a band featuring man of the moment Logan Richardson as his front-line partner – thus, Scott remarked casually, combining the two leading players of their generation on their instruments: trumpet and alto sax. Maybe so: they certainly made a formidable combination, and the quintet – also featuring a remarkable piano player in Tony Tixier – is a red hot outfit. Billed as Stretch Music, signifying an ambition to present a multiplicity of global sounds, the Cheltenham set seemed not to offer room for genre-hopping, but didn’t suffer from focussing on straight ahead jazz. Herbie Hancock’s Eye of the Hurricane suited Scott’s essentially conventional modern trumpet style – featuring Milesian poise allied with Freddie Hubbard level technique – very well. Coltrane’s Equinox evoked the best solos of the afternoon from pianist and both horn players. Scott is technically fleet, thoughtfully inventive, though occasionally falls into mannerism as he manipulates the sound by moving around the microphone. Richardson impressed with a calm authority that held the attention at all tempos. A blistering set that delighted a sold out Jazz Arena. Then more delight for a smaller crowd immediately afterwards in the Parabola Theatre. The trio of Austrians Martin Eberle on trumpet, Peter Rom on guitar and the extraordinary Swiss voice artist Andreas Schaerer delivered a set as amazing as it was musically delicious. Amazing because we heard things never heard before. Schaerer’s explorations of new dimensions of vocal technique opened up by clever use of the microphone are breathtaking. A small sample included a duo with Eberle in which any blindfolded listener would have sworn there were two trumpets intertwining on stage, a song in which he effortlessly popped complex rhythm – no trio including Schaerer will ever lack for a rhythm section – while somehow also singing the words, and any number of improvised flights in which he combined beatbox sounds, operatic swoops,vocalised horn lines and simply sung notes, all in fruitful interaction with the two droll, quick-witted instrumentalists. The result is involving, exuberant, and often humourous music – typified by a piece of Rom’s, The End is Near, that combined a slew of standard jazz endings into one composition, or Schaerer’s anagrammatic Monk dedication The Unloose Hit. As a bonus, Soweto Kinch slipped back onto the Parabola’s stage twice, for some arresting alto and, bravely, a little rapping alongside Shaerer’s own light-stepping, dancing vocalising. It seemed a natural connection between free spirits but the gig would have been unusually memorable without it. This is a fine trio, and the man with the microphone a formidable creative force. A good jazz gig puts a spring in the audience’s step on the way out. This one had the additional happy grins and heads shaken gently in near disbelief that confirm we will be recalling fondly in years to come the evening when we first heard Andreas Schaerer live. Jon's review catches all three gigs very well - and listeners keen to hear the Argüelles/FRBB concert can find it on BBC Radio 3 Jazz Now on 23 May. 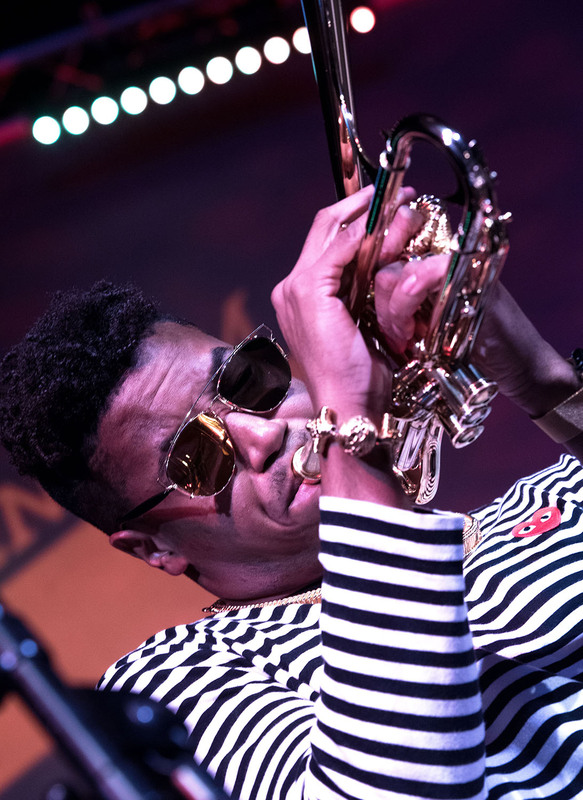 My only caveat was that Christian Scott's gig was ruined by the excessive PA volume. Most of the detail of the music was concealed by the booming bass frequencies and muddy mid-range. It was better than Marcus Strickland's mix the previous day, where the DB level was well above safe health and safety limits. I had to repair to the foyer of the tent to hear that at a halfway reasonable level, as the tiered seating worked as a suitable filter. Given the perfection of the sound at the Parabola and the efforts Jon reports to try and make the best of the Town Hall, it is a shame the Arena gigs all suffered from such insensitive amplification. Scott's gig was pretty loud, although tolerable, and sound mix OK, where I sat (Strickland louder still). The thought did cross my mind that Cheltenham have "solved" the problem of sound leakage from the freestage so evident a couple of years ago by cranking up the amplification in the arena. Look forward to hearing the big band gig again! Some of the arena gigs were way too loud. When compared to Melt Yourself Down they were inaudible but that gig was in a nightclub!